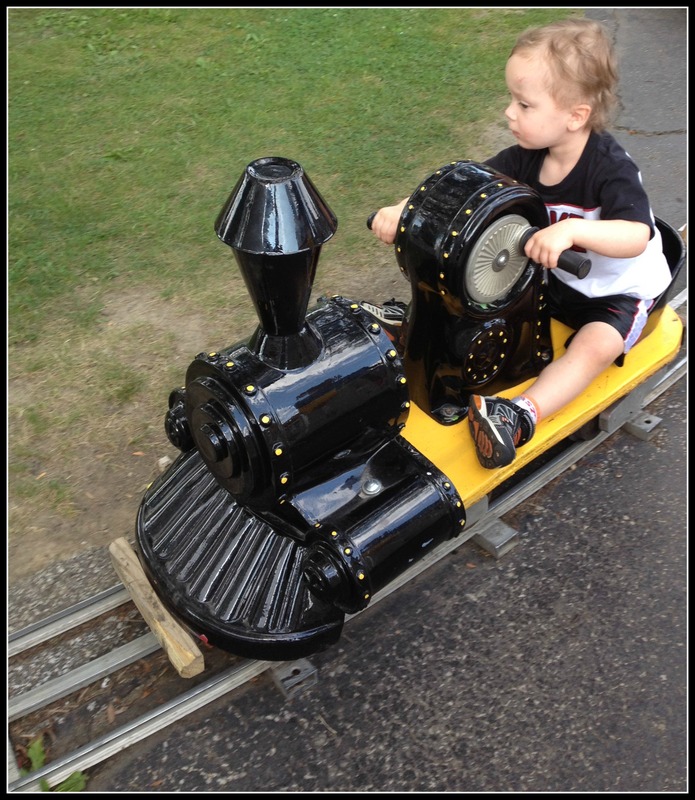 Gage has always loved trains but these past few weeks he can talk of little else. It’s his favorite thing at the library so I can usually peruse the picture books and watch him at the same time, knowing he is unlikely to stray from the tracks. So, we have a rotating train book collection. These three are our current train reading material. We’ve had The Little Engine That Could for months. Our library lets you renew things as long as no one else has requested it. It was his first introduction to the train funnel. This morning when my mom went to wake him up he opened his eyes, looked over at her, and said ‘funnel’. Yea, kid’s got trains on the brain. My Little Train is a nighttime favorite for Gage. Even though I have and do read it to him, he considers this Daddy’s book. It’s cute. I just picked up Freight Train last week and Grandma has already had to read it, oh maybe a few dozen times since she arrived on Thursday. Today, I’ll be making another trip to the library to find some replacement train books. Any good recommendations out there? 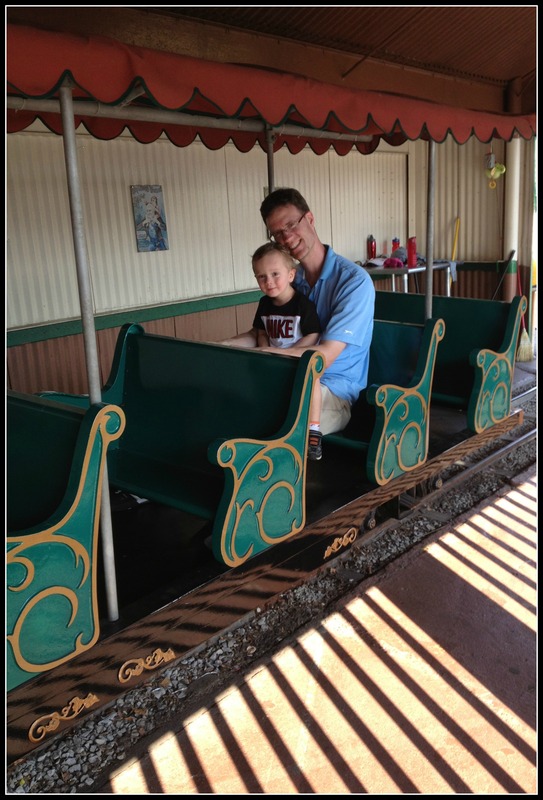 One more way we keep the addict addicted is to take him to the kiddie park every two weeks where he gets to choose from a half dozen rides, but his favorites remain the two train ones. All aboard the crazy train! These pics are from last night. I love that Kiddy Park train! What a lucky boy! The Kiddie Park is a lifesaver! Cute pics! As a child I loved “The Little Engine That Could”. I don’t even remember it! Our great nephew loved trains too but I’m not sure what books they read to him. My mother used to read The Little Engine that Could to Vance – when she got to a certain spot in the book, he would slam his hand down and shout, “No!” We never could figure out why but my mom has not been able to get rid of that book. Too funny! A few weeks ago a sitter was reading Little Engine to him and she said he got very emotional.? Not sure why or where. There are many books that I still know by heart because it was the obsession for awhile! 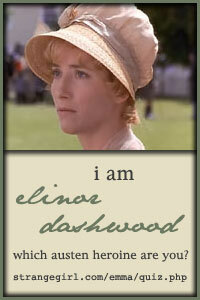 Every once and awhile I will quote books to my kids to see if they remember…..they usually so. The train rides look fun! 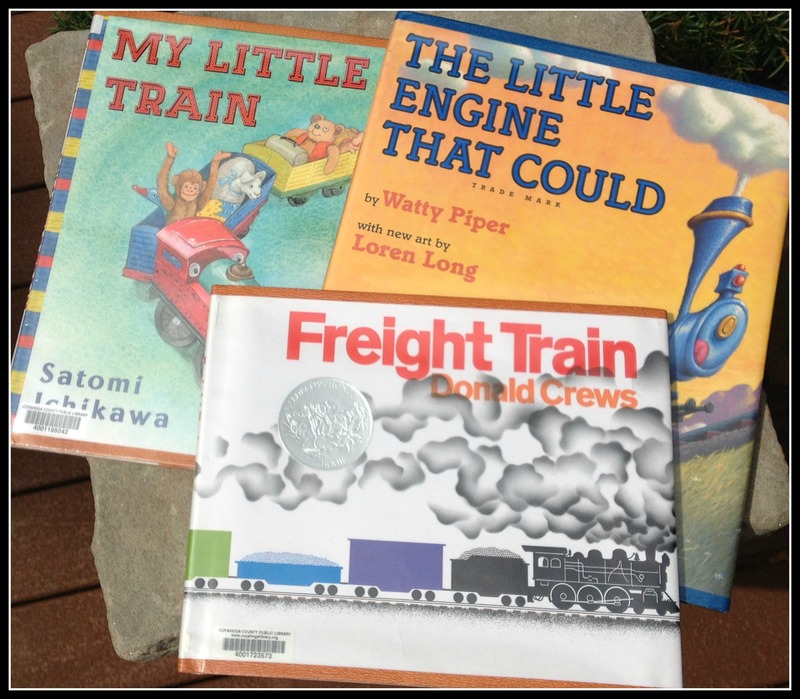 The Little Engine that Could is such a classic – I remember reading it to my girls, too! Does Gage like Thomas the Tank Engine? He LOVES Thomas and Chuggington. We have The Little Engine that Could, and at this point A just likes to point out all the trains and make train sounds. I remember it from when I was a kid, too. We have Freight Train and he loves it, but I’d like more story! I’ll have to check out the others on the list. So fun! I love that he loves trains!!!! Sure. It’s great until you’ve heard the word train for the hundredth time! We have The Pony Engine which is basically The Little Engine that could but a train on the way to the circus. It was my brothers when he was a kid. My child also loves trains and will sit through The Little Engine That Could for hoursssss. We also have The Potty Train which is about potty training and a trains, There’s also My Big Train book and we have Thomas the train 123 book and Thomas ABC book. I’ll have to find The Potty Train. Potty training is not going well here, no matter how many times that Elmo tells him everyone does it! He loves his trains and books. It so fun to read to him because after the first reading he can usually tell me the story! It is a real joy to go to the Kiddie Park and watch him on the rides. Isn’t it funny how kids can get obsessed with things? He’s adorable. Thanks, Carol! I’m hoping for a new obsession!